Modern solar technology can be used for all electrical devices which do not need much power but have to be independent from the grid. 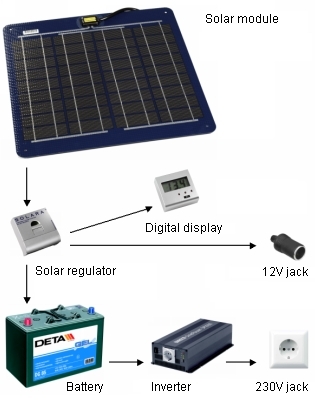 The modular solar systems have been designed for mobile use as well as for steady mounting. They constantly deliver electrical power for recreation purpose, holiday homes, yachts, caravans and also for professional use in research institutes and for sea markers. In our scope of delivery you will find sophisticated solar modules and accessories manufactured in Germany. For an independent and efficient power distribution it is possible to combine solar energy with wind energy with special inverters and with a power generator with UPS function. Do not hesitate to ask our experts for a complete arrangement.